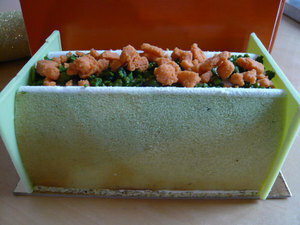 The above photos are of the gorgeous bûche de Noel I will be serving today for Christmas lunch. 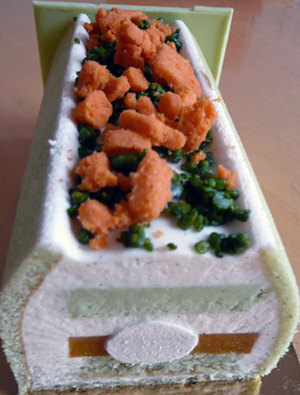 It’s from Pain de Sucre, one of my favorite neighborhood patisseries and is made with pistachio, bergamot, and apricot. I could just eat that for lunch and be done with it, but we will make creamy fennel & potato soup, a fresh ricotta soufflé, and Roman style whole artichokes as a prelude to the bûche. 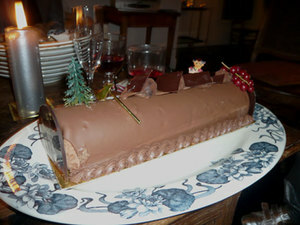 The chocolate bûche pictured below, from a patisserie in Montmartre, was served at lovely Christmas Eve dinner some friends made last night. At their quintessential Paris apartment in St. Germain de Prés with white stucco walls and dark wood beams, they served a delicious meal of foie gras (the best I ever tasted, home-made from a small local shop), roast turkey, crispy pan-fried potatoes, haricot verts, Cantal and chevre cheeses, and last but not least, the bûche. It was a warm, festive evening with laughter, joy and fun and the highlight was when we were singing Christmas carols (yes, the nice, Jewish boy from Brooklyn who didn’t light Hanukah candles this year was singing Christmas carols) and we sang Rudolph the Red-Nosed Reindeer in English, Danish, French, & Japanese. There was a Christmas-only-in-Paris moment when we heard the haunting bells of the St. Germain de Prés church ring at midnight. Merry Christmas to all and hope you are spending it with family, friends, and loved ones. 14 rue Rambuteau, 3d arr. That sounds pretty nice. We had a similar amazing christmas dinner (sans the foie gras and outside of Limoges) with a bunch of homesick european buddhists!